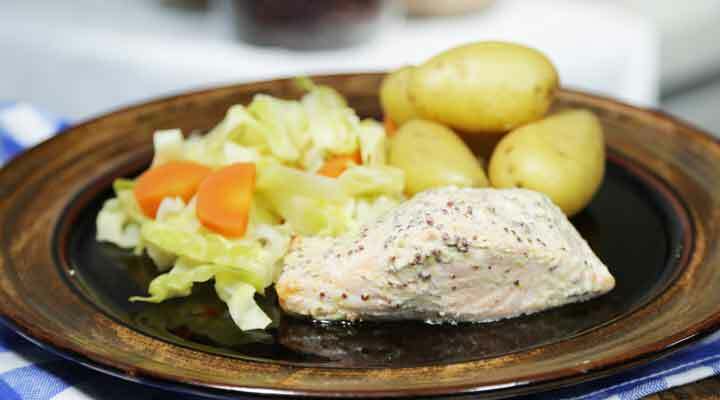 Operation Transformation Recipe - Baked Salmon served with Potatoes and Vegetables. Preheat oven to 200C / 180CF / gas mark 6. Place baby potatoes in a pot of boiling water and simmer until cooked for approximately 15-20 minutes. To make the sauce combine natural yogurt, wholegrain mustard and vinegar in a bowl. Add the salmon fillets to the bowl, coat well with the sauce and place aside. Place salmon fillets in an oven proof dish and place in the oven for approximately 10 minutes until cooked through. Steam carrots and cabbage for approximately 6-8 minutes until tender. Remove salmon from the oven, top with dill and serve with potatoes and vegetables.